For the traditional American Indians daily life contained many symbols. One of the best known symbols is the circle, represented for example by a child born into the “circle” of a tipi, or the human life-cycle based on being and passing away. People sat in a circle around the fire and even tipi camps formed a circle or semicircle. Long before horses were brought to North America, the Indians were used to living in the conical skin tents. During most of the year they lived in permanent dwellings, such as earthern or bark covered huts (although there were regional and tribe-specific differences). These tribes collected berries, mushrooms or herbs, grew pumpkins and corn, and hunted small animals. 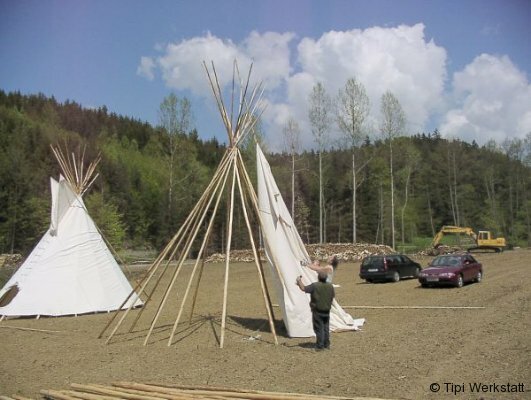 During the buffalo hunting season (in spring and autumn) the hunters would follow the bufallo herds and needed tipis which were light and easily tansportable. Large dogs were used to transport the tipis. The long tipi poles were fastened onto the dog`s saddles and dragged. 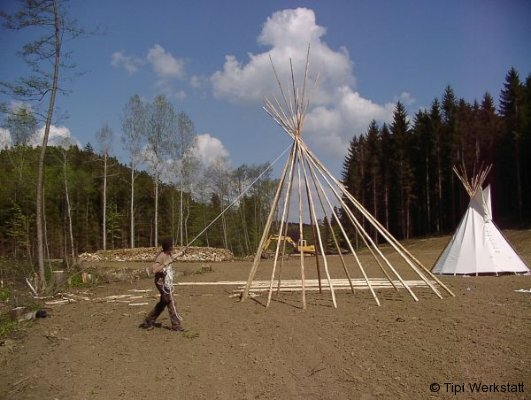 The whole construction was called a travois and carried the tipi hides and any other materials as required. During the first part of the 17th century horses were brought from Mexico by the Spanish explorers, the use of horses making it easier to follow the buffalo herds. Within a short period of time sedentary people became nomades, especially those tribes on the Eastcoast who suffered from the arrival and settlement of the Europeans. The arrival of the Europeans added salt to the Indian Diet and as a result of trade with the Europeans they were able to preserve the meat for a longer period of time. The Indians would use the whole animal: the meat was eaten, the hides were used for tents, clothing, bags and headgear; tendons served for sewing-kits, yarn and bow-strings; bones and horns were used for making tools, scrapers, needles, bodkins and ornaments; the brains, which contained tannic acid, were kept for tanning the dried hides.The hide was tanned white, to keep the inside of the tipi light and comfortable. In the 19th century the Indians began substituting the hides whith white linen. 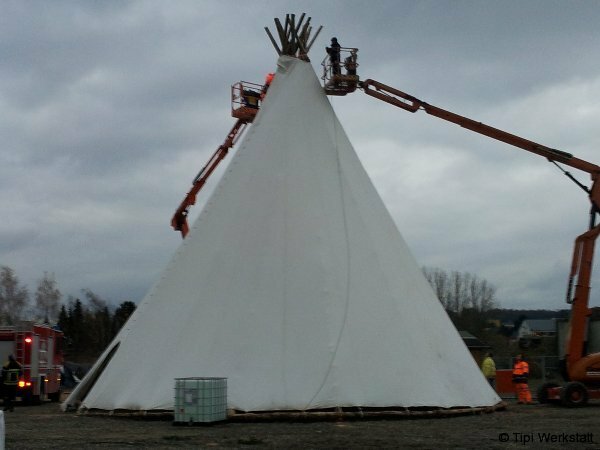 To ensure the right impregnetion, fresh conifer branches were burned inside the tipi for 24 hours, the resin in the smoke making the canvas water proof. 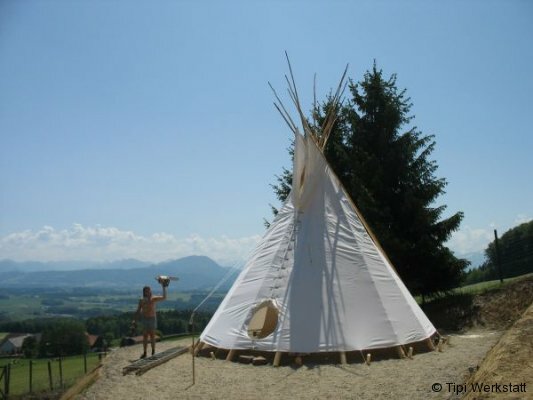 The Indian tipi is probably the cleverest type of nomadic tent, and is in perfect harmony with nature. 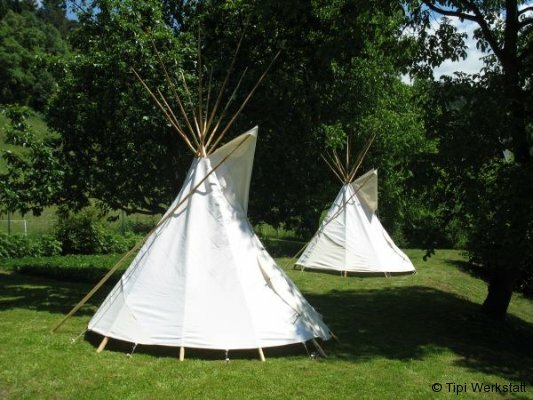 The Indian tipi forms a tilted cone. The short length of the cone is tilted at the back to provide protection against the wind and to allow more head room at the back of the tipi. 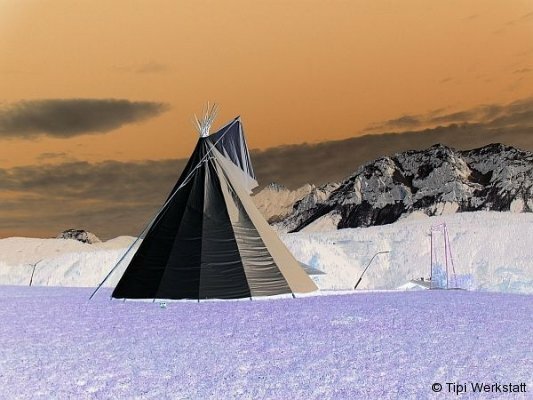 Mainly for more practical reasons than spiritual reasons, tipis were made to face East, as in the plains the winds come predominantly from the West. The fireplace is a little nearer to the door than the actual center, creating additional room at the rear of the tipi. This means that the smoke hole and the smoke flaps are placed directly over the fireplace ensuring that the smoke is drawn out of the tipi. 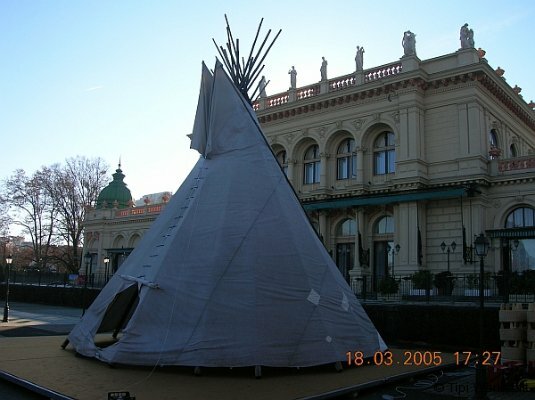 Compared to other transportable tents, the conical shape and the trim smoke flaps make the Indian tipi unique. 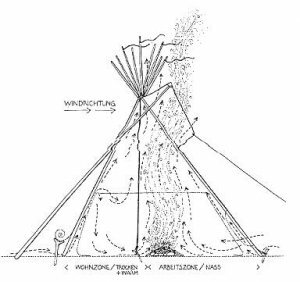 The smoke flaps can be adjusted to shield against the wind, and during rain, one smoke flap covers the smoke hole, so that the tent remains warm and dry, at the same time allowing the smoke to be drawn up through the “chimney”. 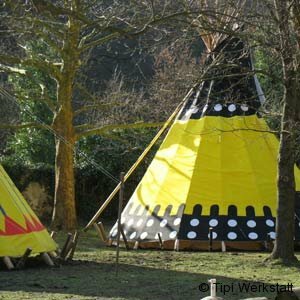 During the cold season an inner tipi lining affords insulation and ensures warmth. 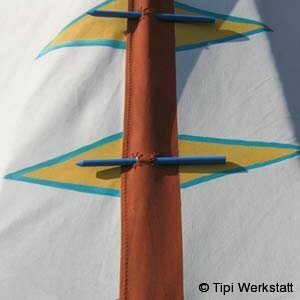 The bottom of the liner seals off the inside of the tipi against draft, rain and small animals or insects. This insures a warm, cozy living space.